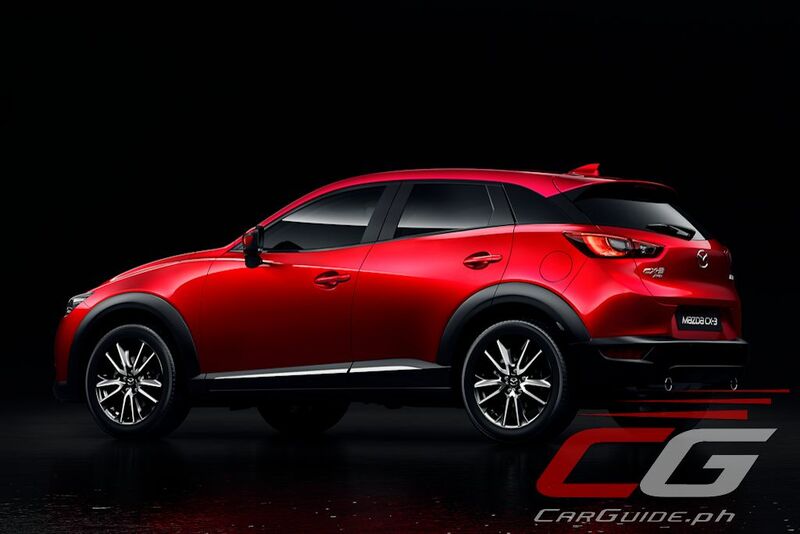 Mazda is expanding its market reach with the launch of the much-awaited CX-3 sub-compact crossover. Dubbed the “freestyle smart crossover”, the CX-3 received good scores during a recent drive from Thailand to Vietnam. Now, it’s finally here and you might as well have your checkbooks ready. Designed for young urbanite couples, the Made-in-Japan CX-3 is the sixth model to showcase Mazda’s striking KODO – Soul of Motion design language as well as a full suite of Skyactiv Technology that delivers a highly efficient driving experience without any detriment to driving fun. And expressive the CX-3 is. Outside, it ticks all the right marks to make it a bold and vibrant crossover. The sharply raked A-pillar, LED lighting assembly, blacked-out D-pillar, and 18-inch wheels (on range-topping variant) make it captivating to look at. Inside, soft-touch paneling with suede trimmings, metallic and piano black accents make for a one-of-a-kind cabin treatment while the Mazda Connect infotainment system and Active Driving Display heads-up display system make for an easy-to-use and operate driving environment. Audiophiles will be happy to hear (no pun intended) that the top of the line CX-3 features a Bose sound system with 7 speakers including a spare tire mounted subwoofer. Inside the sculpted hood, the CX-3 shares one engine across the range: the 2.0-liter Skyactiv-G engine with 148 horsepower and 192 Nm of torque. The latter comes as low as 2,800 rpm making for an entertaining experience behind the wheel. The i-STOP engine idle start/stop system meanwhile further improves fuel efficiency. 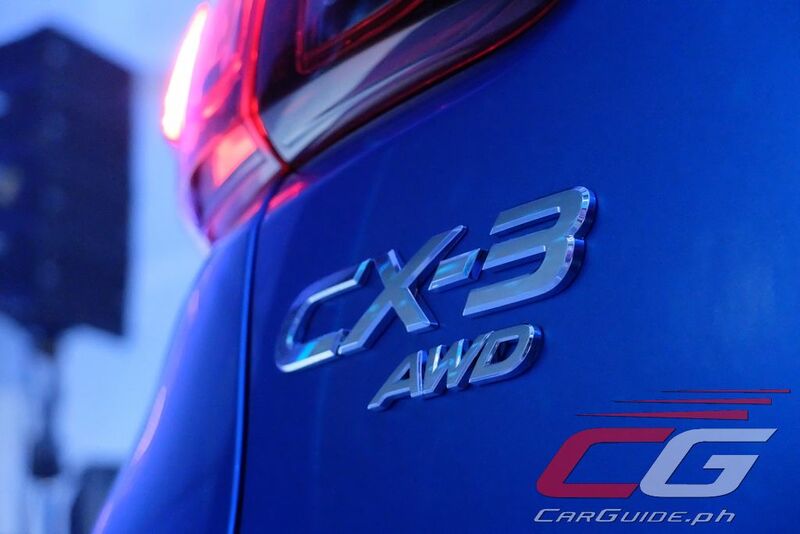 On the top-of-the-line model, the CX-3 is the only one in its class to get an AWD system. The i-ACTIV All-Wheel Drive system make it capable of traversing varying road conditions while improving all weather safety. It’s also a predictable AWD system that automatically transitions from front- to all-wheel drive by actually reading road conditions ahead. The CX-3’s transfer case is so compact that it keeps the same Torsion Beam Axle suspension as the FWD variants. Safety doesn’t take a backseat in the CX-3 too. It receives a full complement of 6 airbags as well as ABS, EBD, Brake Assist, and even stability control. Rear parking sensors with a reverse camera complete the package on higher variants. The all-new Mazda CX-3 is available in three variants: FWD Pro (P 1,280,000), FWD Sport (P 1,380,000), and AWD Sport (P 1,480,000). The FWD Pro comes in Crystal White Pearl and Dynamic Blue; the FWD Sport in Crystal White Pearl, Soul Red, Jet Black, and Titanium Flash; with the AWD Activ adds the unique Ceramic finish to the mix. 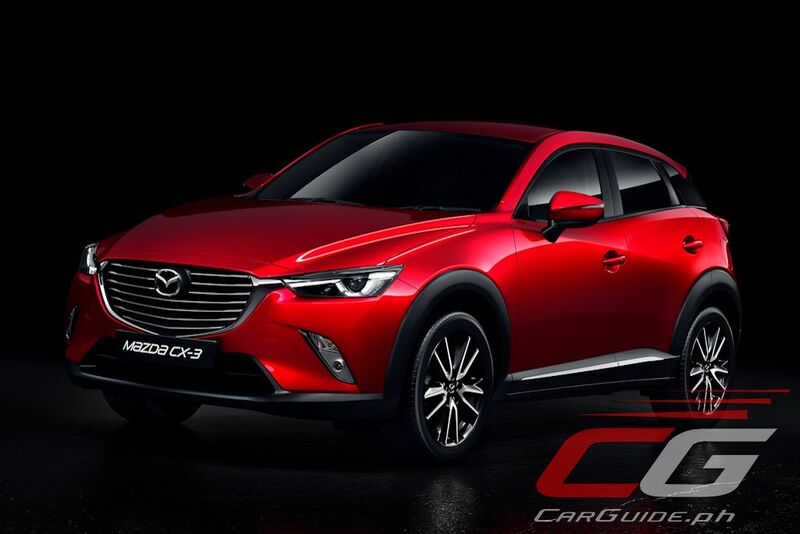 The 2017 Mazda CX-3 will be on display at the 6th Philippine International Motor Show. 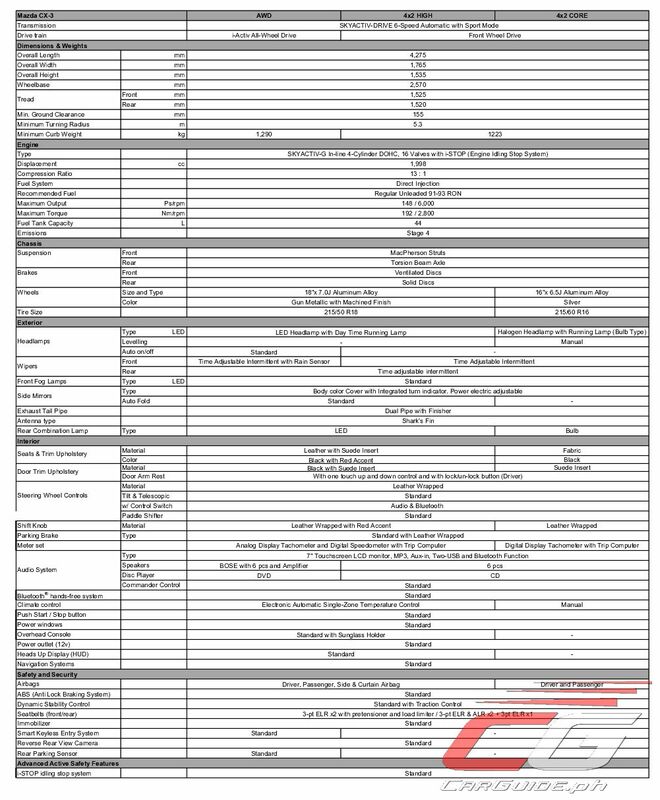 Also, if you think 1.3-1.5m is expensive, see Honda's HRV which only has a 1.8L engine and no AWD. 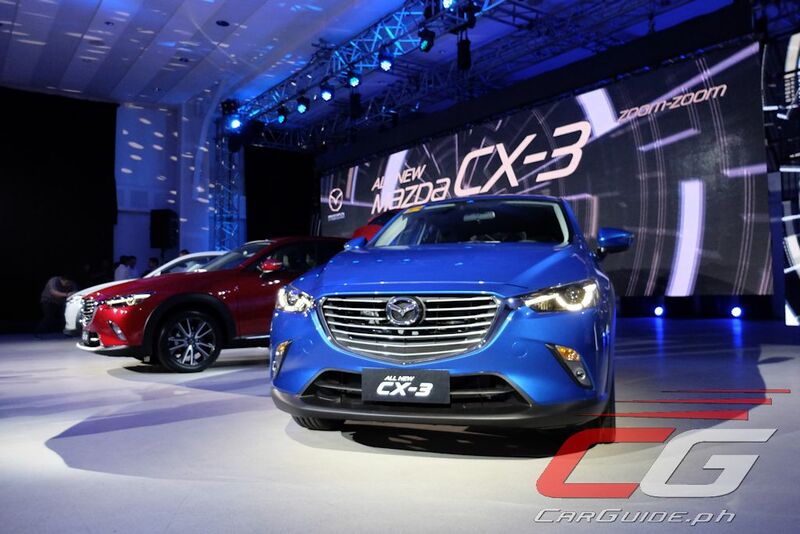 The top variants of the HRV and the CX-3 are similar in pricing. 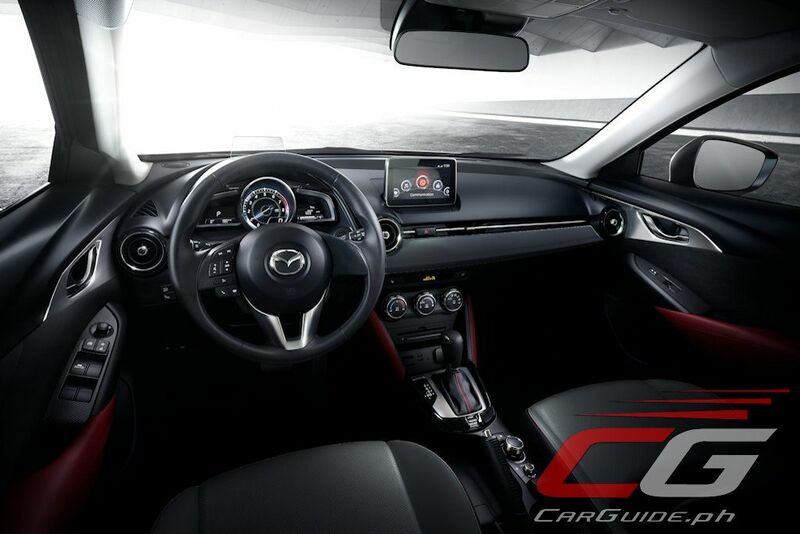 Try to test drive and sit in the CX-3's cockpit to appreciate it. 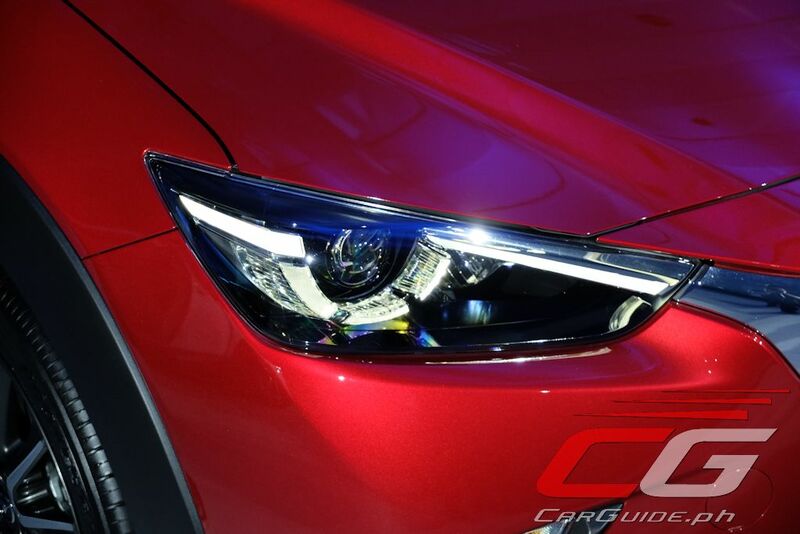 :) You'll see the difference of the CX-3 over the Ecosport and the Juke. CUV's are made for people who want the versatility of an SUV but don't want the cumbersome size of one. If you say so. Personally, I would pick the updated Mazda 3 over the CX-3 anyday. On the other hand, why do people buy the Mini Cooper or the Audi A1 at a price around 2m? I think the CX-3 is a middle option for those who want a small premium car but not as expensive as an Audi A1 or a Mini. You can see and feel Mazda's superior build and material quality over Toyota and Honda. I think you haven't been in a Mazda 3 2.0 or CX3 sport, or even in a Mazda 2 Speed. The only gripe I have is the door's light feel, well at least the engine has less weight to carry around. What I liked about Mazda is that they offer cars(TOTL variants) a luxurious design, feel and build without the price. Luxury brands especially the German Marques are overpriced and not worth the price. I would prefer Lexus' offerings than their overpriced offerings. Well, you could blame the high tax with that. Watch a comparison of a Mazda 3 TOTL and a Mercedes Benz A class. You only buy luxury cars if you have a lot of excess cash, and I mean lots of it. I have a question. 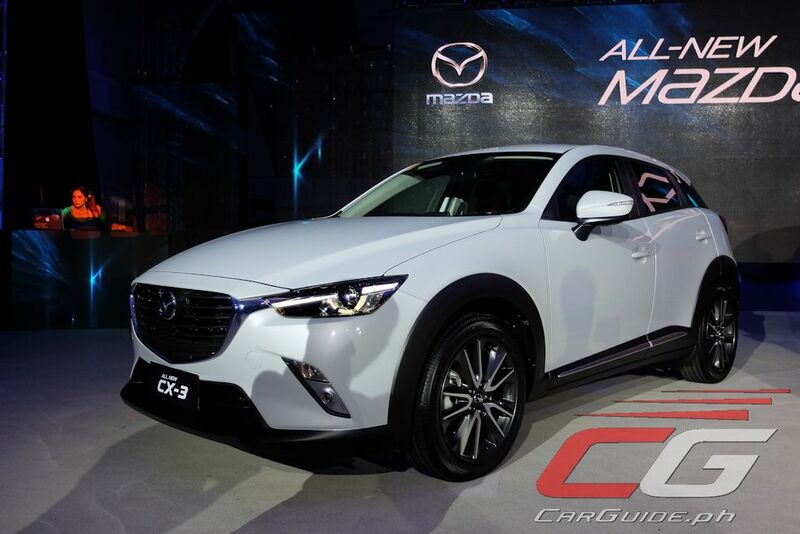 The ground clearance of the cx 3 is 155mm right? But isn't the ground clearance of the mazda 3 also 155mm? If that's the case, why not get the mazda 3 hatchback if you need cargo space instead of a CX-3, which is only based on the inferior mazda 2? 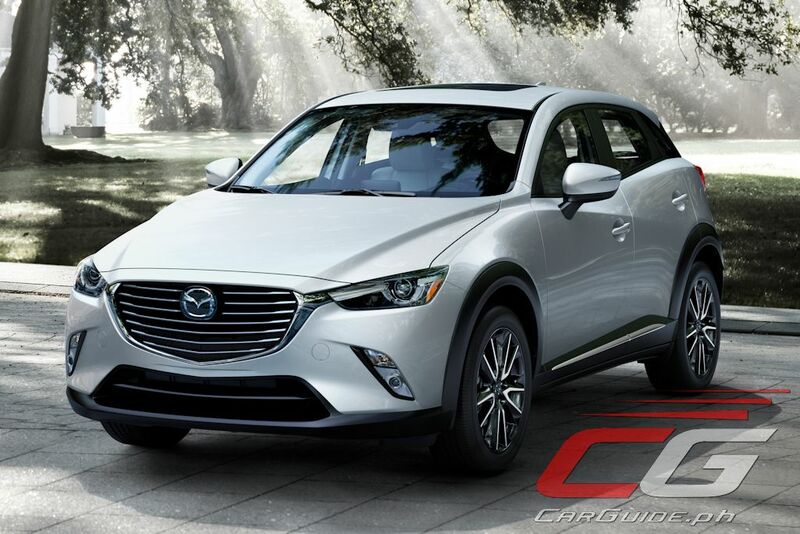 Does the CX-3 have any other advantage other than having a model offered with AWD? Why in the world is it more expensive than the mazda 3? I would still pick the updated TOTL Mazda 3 over this. What is the wading depth of this CUV? This is too expensive! Honda HRV is up to P1.345 M only. I have many reasons why i shouldn't buy this car ground clearance, Price, smaller than HRV and ETC. The Honda HRV Mugen is 1.5m, whereas the EL without Mugen is 1.348m in which it only has a 1.8L engine and no AWD. (I excluded the subjective design). I agree that the size and ground clearance is lacking but this is a CUV. Personally, I would rather buy the TOTL Mazda 3. This is out for me. I'd better wait for the Datsun GO Cross Sport. Looks good outside and inside. It's the more premium choice for the segment. If we'll be looking at "bang for the buck" which is better? 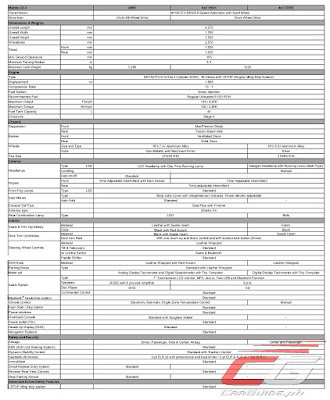 HR-V E at 1.238M or CX-3 Pro 1.280M? I'm leaning towards the HR-V as it is already a mid variant model with automatic climate controls, keyless entry, flexible interior space, 17" wheels. CX-3 is CBU from Japan though, so it says a lot about quality. And Mazdas are known for their sporty driving dynamics. Get the mazda3 hatchback instead of the cx 3. They both have the same ground clearance. Why shell out more for a glorified mazda2? Get the top variant 3 hatch or sedan. The updated Mazda 3 is coming this month. It's not much of a surprise. They've been saying it will get here soon. The prices aren't a surprise too. Mazdas are expensive because they are charging the maintenance in advance. It's youjin, remember. If you compare the top variant Altis and the Mazda 3, the Altis is more expensive by 10k php, and the Mazda 3 has better features and the Yojin 3 is already included. It's expensive due to it being brought from Japan(taxes). That is a positive one for me because conventional autos have better feel, but CVT's are more fuel efficient. 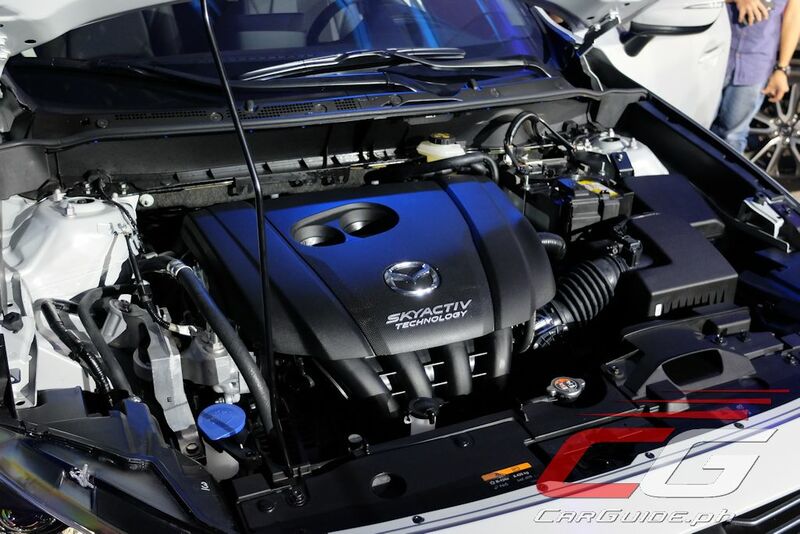 But the Skyactiv drive combines the best aspects of the a conventional, CVT, and DCT. ;) Try to drive a Mazda 3 6 speed auto and a Civic with a CVT. They should make the price cheaper and increase the ground clearance. People would get the cheaper but better mazda 3 instead under the current conditions. Then why get a cx3 when it has the same ground clearance as a mazda 3? They should increase the damn ground clearance, no one cares about driving dynamics in traffic. Designed for young urbanite couples? Young couples with a baby or child will not even consider this. Good luck fitting in the child seat in the backseat or the stroller in the boot. 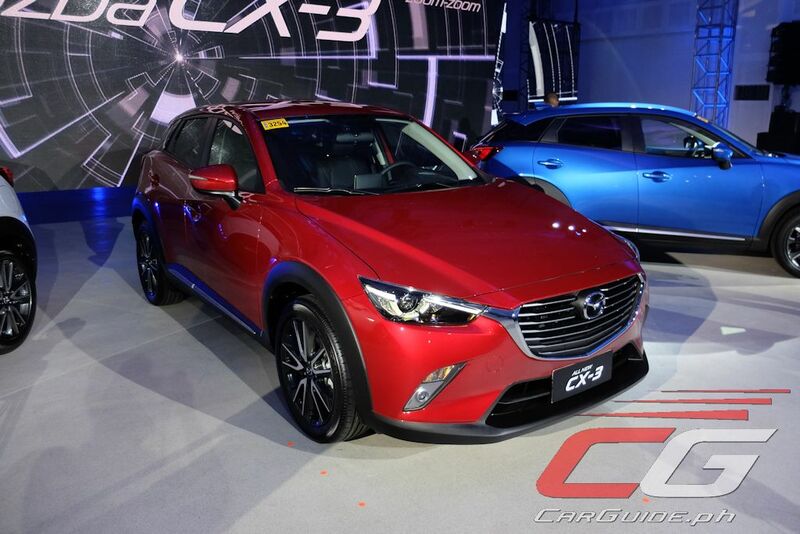 Title should read "Mazda Philippines Springs Nasty Surprise in CX-3"
Wow! Parang mahal ata, should 100k lower! The ground clearance and pricing ruined it. Tsk.. I'll buy the 7 seater brv instead for my family. The ground clearance and pricing ruined it. Tsk.. I'll buy the 7 seater brv instead for my family before the year ends.